In a laboratory on the grounds of a police-guarded complex, 11 white-furred rats wait their turn to impress trainers and perhaps receive a bit of sugar as reward. The rodents could play an important role in making conflict-wracked Colombia safer. They are in the final stages of a training program to find landmines that kill or injure hundreds of people each year in Colombia. The government project, which began in 2006, trains specially bred rats to detect the metals used in landmines, thousands of which have been laid during the country’s decades-long conflict with left-wing guerrillas, Reuters reports. Colombian scientists decided to use rats because, like the dogs more traditionally used in landmine detection, they have a highly developed sense of smell. But the rats are lightweight and unlikely to detonate mines. 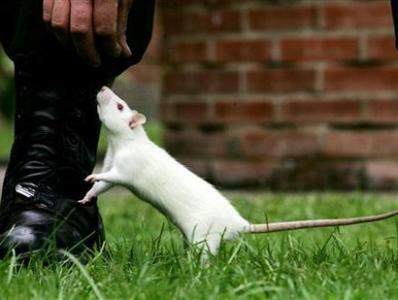 The rats are first taught to recognise voice commands and the specific smells of metals used in landmines, and then to work in large, outdoor areas, where the rodents will sniff and scratch when they find mines, as watchful handlers who will be well-trained in demining stand close by. It has taken government scientists five generations of rats to be confident their training program is thorough enough to begin sending rats out into the countryside. In the laboratory, an element of instinct has been built into the training, with baby rats scurrying after their mothers in plastic mazes during practice sessions. The mothers show their young how finding the dead end containing the same wires and metal pieces used in landmines can earn you a treat. “These rats will be a great help, and will provide great input to those trying to carry out demining,” said Erick Guzman, the police official and former canine handler who now is responsible for much of the rats’ outdoor training. “We are hoping that this generation will be ready at the beginning of next year to be tested in a real environment,” he added as his favourite rat Sophie perched on his shoulder. Experts say it is impossible to estimate the number of undetonated mines which remain in Colombia, but their impact is horrifying real. In the first half of 2011, for example, mines killed 40 people and injured another 247, government statistics show. That compared with 535 dead and injured throughout 2010. Experts confirm that most mines are planted by the Revolutionary Armed Forces of Colombia (FARC), other guerrilla groups and criminal gangs to deter security forces. The government says 31 of the country’s 32 provinces may contain mines. “Contrary to what you see in other countries that have signed the Mine Ban Treaty, mines continue to be planted in our country … while other countries continue to get the number of mines down, ours goes up,” Luisa Fernanda Mendez, the scientific director of the rat program said. Landmines are a pressing problem for security forces. More than half, or 63 percent, of landmine victims are military and police personnel, according to government figures. Landmine clearance in Colombia is unusually slow-going because mines are sown in very close proximity to each other in rural areas only, making clearance operations treacherous. The Colombian government cleared less than a tenth of a square mile in all of 2010, but uncovered a total of 194 explosive devices. Non-government organizations (NGOs) in Colombia have until recently only been allowed to help landmine victims, not to mount demining operations themselves. “Currently there is no humanitarian demining process except the one undertaken by the armed forces … we have objections to that demining because, in our judgement, the process is not compatible with international standards for humanitarian demining,” said Alvaro Jimenez, the national coordinator of the Colombian Campaign Against Mines. The Organisation of American States hopes to help NGOs expand their fledgling demining operations. They have mounted a program, to be completed by the end of the year, to train and accredit NGO demining teams to work in Colombia. But despite any critiques of the government’s current demining effort, rat project director Mendez has high hopes. “If we do not begin to master the demining process, we will never complete the terms of the treaty, and moreover, we’ll never have a free countryside,” she said, while giving the rat crawling up the sleeve of her lab coat an affectionate pat.